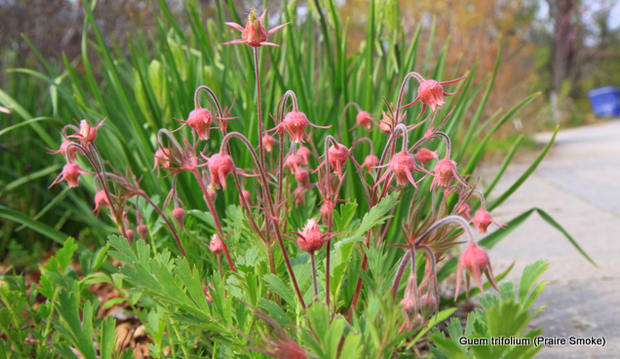 Geum triflorum, Prairie Smoke. In the distance are clumps of Camassia leichtlinii, a western native that will soon add a riot of star-shaped, blue-purple blooms on 60 to 90 centimetre (two to three foot) spikes. Choosing a feature plant was a bit of a challenge, as the gardens are bursting with an assortment of flowering spring bulbs, perennials, trees and shrubs. Each and every day new blooms appear. When Sandra, Fabio (our new seasonal gardener), Sue (our garden intern) and I walked the grounds at the start of the week, we all commented on how quickly everything was growing—especially the weeds*. 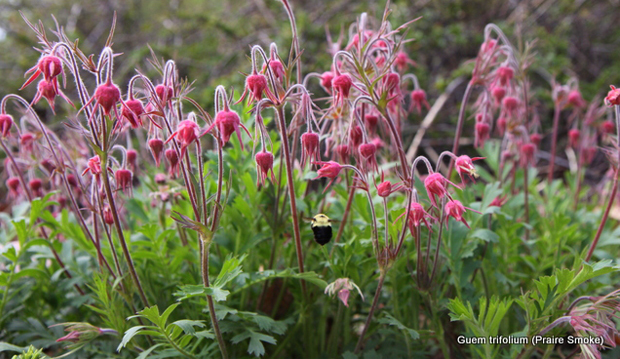 After much deliberation, I finally decided to highlight Geum triflorum, commonly known as Prairie Smoke. This native gem is just coming to the end of its blooming period along the north end of the Nature’s Garden just across from the President’s Choice Show Garden. If you look carefully, you’ll discover more G. triflorum dotted in the Entry Garden Walk by the Annie’s Straw Bale Shed. Take my word for it, there are also small clumps on the green roof. For me, the real show from this 15 to 30 centimetre (six to 12 inch) low-growing perennials just beginning. 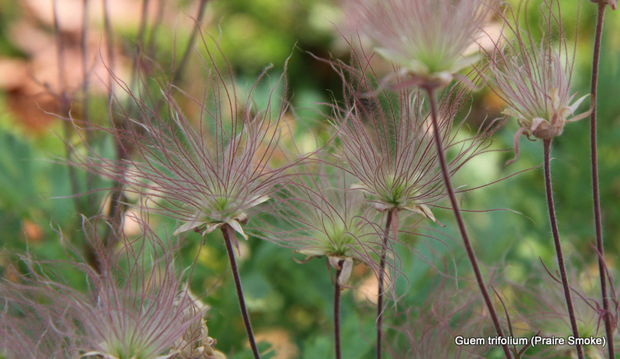 As the nodding blooms fade, the developing seed heads produce a grey wispy and feathery appearance, hence the common name. While Prairie Smoke thrives best in full sun, I’ve also seen plants doing reasonably well in partial shade. They’ll often self seed and naturalize in the garden. Tolerant of dry soils and hardy to zone 3, G. triflorum is much loved by bees (particularly bumble bees) when in bloom. It is also deer resistant. *A note about weeds: The recent rains have created an explosion of weeds throughout the garden. Invasive plants such as Garlic Mustard, Alliaria petiolata, are currently blooming. A tip: If you cannot dig up and remove the plants, cut off any developing seedpods as they form. This helps reduce the weed’s spread. Personally, I make it a point to pull approximately 25 weed seedlings every day. At TBG, I do it either first thing in the morning or before I head home for the night. This season there is no shortage of these quick-growing opportunistic plants. Our incredible team of garden volunteers continues to fight the battle every week. We’re very fortunate to have a passionate and dedicated team of about 30 garden volunteers. They spend approximately 150 hours every Tuesday through Thursday assisting with garden tasks. TBG wouldn’t be the same without the support of our incredible volunteers who work under the direction of head gardener, Sandra Pella. Calcar: A spur or spur-like appendage. * The petals of columbines (Aquilegia spp. ), such as this A. canadensis, form spurs out the back of the blooms….